Pay per click, commonly known as PPC can be defined as an Internet advertising model that helps in directing increased traffic to websites where advertisers pay the hosting service when their ad is clicked. 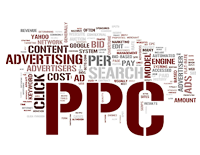 Highly professional and efficient PPC services are helpful in effectively managing PPC accounts. They also help in improving the return on investment (ROI). Unlike the conventional methods used for advertising, with Pay Per Click services advertisers are not required to pay when their advertisement is displayed, instead they are only required to pay when their advertisement is clicked by a visitor who is then directed to the advertiser’s website. Experience: Having more 12 years in PPC, we have seen it all – the updates, new features, new tools and more. We are one of the few companies highly specialized in the field of Pay Per Click Management. Certifications: We are Google Certified Partner and Bing Ads Accredited Professionals and we are proud of it. That way, you can be sure that your account is always being managed by someone you can trust. And a trustworthy, certified professional the best person to cater you with a good ROI. Expertise: We're process-driven and have proven procedures that deliver results. We use collective pay-per-click management proficiencies to ensure that your account have the best available expertise. In today’s highly competitive market, excellent Pay Per Click services play a vital role in helping online businesses achieve visibility in all the major search engines like Google, Yahoo, MSN and more. We at Netsterz aim at providing our clients with the most comprehensive PPC management strategy in order to help them save time, enhance the performance of internet advertising, and increase the efficiency of expenditure by lowering down the costs. We at Netsterz have evolved into a leader for providing highly professional and affordable Pay Per Click services. Our services are designed to deliver exceptional results in a faster manner. We offer 100% flexible, measureable and accountable services that are capable of increasing search engine rankings and generating more and more visitors to a website. Your Ad becomes visible on the search result page once your PPC campaign goes live with the search engines. Within the campaign, you are required to define the amount you are willing to pay per click. By doing so, you can easily outbid your competitors and your Ad will be displayed in the first PPC position. Browse through our website for further details.